MiniCalendar provides the ability to render a small month view in any HTML container on a page. MiniCalendar can be put into 3 places (each place 'requires' its specific code): in the scheduler header, in the lightbox, or in an HTML container outside the scheduler. You can place the mini calendar into the header of scheduler. The method returns a miniCalendar object that can be used for further calendar configuration. The mini calendar can be used in the lightbox for "start" and "end" dates selection. The mini calendar can be placed in any place of the page outside the scheduler. Container - (string) the id of a DOM element where the mini calendar will be placed. Date - (DateTime) the initially selected date. Handler - (js function) the handler function of the 'onDateSelect' event that is called when the user makes an explicit date selection using the mouse. 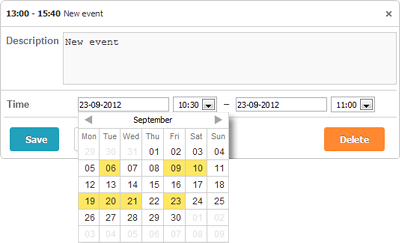 IsAttachedToHeader - (boolean) checks whether the mini calendar is attached to the scheduler or another DOM element. Navigation - (boolean) allows mouse scrolling. Position - (string) the css class name of the element which the mini calendar will be attached to. The property is used to set the position of the calendar in the scheduler. Specify the desired html element through its css class and anytime you click on this element, the mini calendar will appear.